sufriendo lo cotidiano del presente en que no estás. 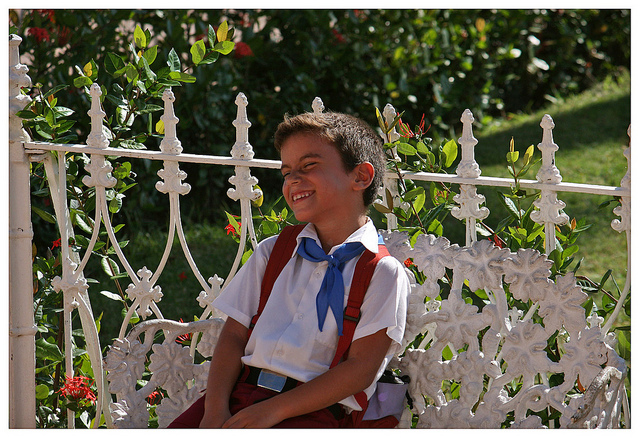 el recuerdo de tu risa me hace convertirme en niño. y en busca de alguna pista de antaño me subo al carro. ha dejado un desencanto que comienza a florecer. los intentos que el pasado trae de vuelta a la cena. las canciones hoy amargas antes eran las querida’. y la lágrima escondida, por la mejilla desgarro. solo que, para la métrica, mejor escribirlo junto. y me ahogo en una foto, de los dos, con mi autoestima. mucho antes de conocerte te escribí y no lo mereces. que juraste para siempre que no haría esta poesía. Making English the official language of the United States has been a political issue for quite some time, but in recent years, due to a surge in immigration that has sparked nationalistic sentiments; the quest to nationally formalize the language has taken an increasing powerful form. Proponents of the measure claim that English is an imperative symbol of national unity and that having more than one language utilized at the state and federal levels is a direct threat to the homogeneity of the country. They propose eliminating bilingual voting ballots and bilingual education, among other things. They sustain that immigrants from all groups must adhere to mainstream “American” values, integrate, and absorb this culture without providing their own social or linguistic contributions. Opponents of making English the official national language of the United States contend that this type of measures are racist and xenophobic and are particularly directed at the increasing (and threatening in terms of numbers) Hispanic population. Some of these scholars affirm that eliminating bilingual education would be a direct attack on minorities and that making English official will only bring problems and not many benefits to those seeking the measure. They furthermore allege that a bilingual society does not pose a threat to national unity, and that Hispanics are indeed learning English and assimilating to “American” mainstream culture at comparable rates to other immigrant groups. The present study will examine both sides of the issue and mutually analyze the validity of arguments in favor and against making English the official language of the nation. It will additionally discuss if such measure has any chance of ever been practically implemented by the federal government and the prejudicial and or beneficial effects that such a measure would have for “mainstream Americans” and minority groups. The author believes that proposals such as the ones discussed in this investigation are intrinsically prejudiced and are strictly directed at minorities that persist on having their own cultural and linguistic identities and object integrating to the mainstream “American” society and adopting its values. The author furthermore considers that forcing immigrants into adopting these values and abandon their national identities and languages is immoral and discriminative, and will result in increased national disunity and more social, cultural, and racial predicaments than benefits to the United States. One out of three “Americans” believe that English is the national language of the United States, this is not the case; in fact this nation has no official language. English is nevertheless the de facto language of the country since ninety seven percent of the population claim to be able to speak it at a moderate to expert level. Unlike many other nations, the constitution of the US does not mention this subject, mainly because the founders were not concerned with linguistic matters; since a vast majority of them were Anglo-Saxons, they did not feel that it was important to officially declare that their language needed to be the one of the nation. “[T]o these English-speakers, language legislation would have seemed a trivial concern” (Magner, 406). Throughout the history of the United States, declaring English the official language and prohibiting the use of other competing tongues has not been a dilemma because past immigrants have adapted quickly to “American” values and culture and have absorbed and utilized the de facto language of the land without putting a fight. Nevertheless, in recent decades, a major increase in Mexican and Latin American immigration has sparked grave controversy and calls for declaring English the sole language of the nation, since according to the proponents of these measures, these groups are not like previous immigrants; they refuse to speak English and want to impose their values over “American” or Anglo-Saxon principles and ideals. Moreover, statistics have shown that in the near future Hispanics as a group will continue to increase in size at a disproportionate level; this adds to the fears many people possess of having a new ethnic majority in this country. Lastly, these new immigrant groups are provided with a number of benefits, such a bilingual education, bilingual voting ballots, and many other bilingual services that infuriate people who fear the power that such a vast amount of people could have on “American” values and culture. As a result of many of these issues, the English as the official language movement was born in the nineteen eighties in order to try to stop the influence of these immigrants and force them to use English and be part of “American” mainstream society. The utilization of multilingual voting ballots throughout the United States is one of the key issues that the English as the national language movement is trying to proscribe. The organization claims that providing this service vastly harms national unity. “There have been numerous complaints about the use of bilingual ballots both for the complications they introduced into the electoral process, but more importantly […] they encourage ethnic divisions” (Magner, 410). Moreover, proponents of English as the official language argue that these machines that provide voting ballots in dissimilar languages are very costly and they are paid with taxpayer funds. Lastly, they insist that a key requirement for everyone that becomes a citizen of the United States must be that they are proficient in English. If this was the case, the need for these machines would not exist. A second crucial matter advanced by the proponents of English as the official language of the United States is the elimination of bilingual education mainly because “[t]he presence of non-English speakers on our streets and in our classrooms tends to generate friction and resentment” (Heller, 12). Once more in the name of national unity, they proclaim that education should be solely in English and that the only time that another language should be used is when this is utilized to teach English to recent immigrants. Furthermore they insist in that teaching in the students’ native language makes it difficult for them to learn English and makes them dependent on their original tongue; isolating them further from other native students. “[The current system] dragoons children into bilingual programs that reinforce the students’ dependency on their native language and then makes escape impossible” (Magner, 410). By prohibiting bilingual education, recent immigrant children and teenagers would not be able to learn diverse subjects in their native tongues and would be forced to attend regular classes without any linguistic assistance. “Students would not understand instructions in subjects like science or math until they became proficient in English” (Califa, 309). Lastly, a third vital concern advanced by advocates of English as the US’ formal language involves employment. They believe that a key occupational requirement should be proficiency in English and that people should be denied of the right to work if they do not possess this skill. They furthermore insist that English should be the only language spoken in the workplace and that people should be disciplined and even terminated for speaking their native tongue in their place of work. They seek to reverse a guideline adopted by the Equal Employment Opportunity Commission in 1987 which states that “a rule requiring employees to speak only English in the workplace was a burdensome condition of employment” (Califa, 310). A reversal of this law would negatively affect millions of workers, especially Hispanic, that are not proficient in English or that utilize their native tongue as a medium of communication when they are working. The goals and objectives of the English as the official language of the United States’ movement are straightforward. Our analysis now focuses on the reasons underlying these desires and the rationale behind attaining the aforementioned policy changes. National unity and patriotism are often cited by the members of the movement in question as the main reasons why they seek to establish English as the official language and diminish the impact of other tongues, principally Spanish. Keeping the United States safe from other cultural and societal influences is extremely significant to the movement, especially during an epoch where Hispanic immigration is very high and “it is believed that a reconquista or re-conquest of the American Southwest, a territory once belonging to Mexico, is well underway [and cannot be stopped] unless Mexicans assimilate the values, beliefs, and language of the United States” (Gershon, 1523). To the members of this movement, being an American patriot signifies waging a war against this new menace to US values and the way of life of the people of this country. To most Anglo-Saxons and members of English as the official language of the United States movement, being patriotic is deeply attached to recognized “American” values and especially the English language. Therefore patriotism is one of the main reasons why they support the elimination of competing languages and cultures that are not aligned to the traditional ideals that they seek to defend. The highest threat to this way of life is obviously Spanish and the solid Hispanic culture; because of this, “proponents of the English-Only movement typically single out Spanish-speaking Latinos as the main impetus for their activities” (Gershon, 1524). They generally assert that this group of immigrant is the most problematic because they do not want to integrate to the regular “American” culture and prefer to promote their own way of life and language. Extensive research has discovered that Anglo-Saxons who identify themselves as being patriotic, generally favor English only policies because they see this language as a core value of the United States that unifies the nation. “As such, high levels of patriotism are likely to coincide with a desire to preserve and protect American culture, identity, and community” (Gershon, 1527). In the minds of these “patriots” the United States is immerse in a cultural war against a competing set of values and way of life that requires them to focus all of their attention and efforts into combating this threat. Research has suggested that most Latinos are also patriotic, but to them patriotism generally does not have the same meaning. They do not see English as a key part of being patriotic and believe that a mixture of identities and ways of life is more reflective of “American” values, culture, and civilization than a homogenous society that rejects external influences. It is because of these facts that a vast majority of members of the English as the official language of the United States movement are Anglo-Saxons that hold and support the aforementioned ideals and beliefs. The English as the official national language movement has not achieved a federal law as of yet but they are continually trying to accomplish this objective. “[Law makers in Congress] have proposed in both houses joint resolutions that would amend the Constitution, making English our official language” (International Journal of, 1). The movement’s success in many States has proven that numerous people agree with them and are willing to support their proposals in the voting booth. According to US English, to date, thirty states have adopted English as the official language statutes (US English website). The issue is being pushed in other states and even though a federal law does not seem likely, due to the many personal freedom violations that are attached to the propositions, the movement’s leaders feel that the battle will be won state by state. The American public at large seems to agree with many of the proposals presented by the movement. “On public opinion surveys, large majorities consistently support the idea of making English the official language and providing government services, such as election materials, only in English” (Schilddkraut, 446). These state laws have not been rebutted by courts or challenged whatsoever. As a result of these legislative victories, the opponents of the English only movement intensively try to fight these ideas, since although they have not become federal law, they are slowly making the country “officially English” one state after another. The English only movement has many detractors who consider that the ideals advanced by the group are discriminatory and racists in practice and theory. They furthermore consider that their fears are unfounded and that Hispanics do not present a menace to traditional “American” values as supporters of the group proclaim. Moreover, opponents of the organization in question consider that advancing the policy changes proposed by English only will deeply harm immigrants in the United States and will not bring positive outcomes for anyone. Instead of creating national unity, detractors assert, implementing these policies will create deep racial, societal, and cultural divisions between recent immigrants and other groups. In their minds, the US is similarly involved in an intense cultural war and they should concentrate their efforts in defending the right of immigrants to conserve their traditions and to not be forced to speak a language and follow a culture that they do not want to adhere to. The idea that Hispanics do not want to speak English and do not want to integrate to mainstream “American” society is challenged by opponents of the English only movement. “Hispanics are acquiring English-language proficiency at the same rate as other immigrants, a fact which undermines the movement’s basic assumption to the contrary” (Califa, 295). It seems on the surface that the group wants to preserve their language and customs at all costs but if examined deeply, Hispanics are indeed assimilating “American” values at comparable rates to other immigrant groups. In many instances it does not look this way because Hispanic immigration is constant and the newcomers portrait their own culture and traditions as expected; but the ones that have been in the United States for over one generation adapt to the US’ way of life rapidly, just like any other group. “The McCarthy and Valdez Study showed that the classic three-generation model of language acquisition is present for Hispanics” (Califa, 314). This signifies that a majority of Hispanics prefer English and mainstream US values by the third generation. As a result, detractors of making English the official language of the United States sustain that Hispanics and specifically the Spanish language are not a threat to the American way of life, its culture, and mostly Anglo-Saxon traditions and that putting these laws into practice would not benefit anyone. “For most members of the majority language group in the United States the tangible personal costs and benefits of bilingual government or ‘official English’ are neither clear nor substantial” (Citrin, 1). Critics of English only’s prepositions furthermore declare that eliminating bilingual voting ballots and education could be detrimental to many Hispanics and a direct attack against them as an ethnicity and culture. They claim that bilingual ballots are utilized by citizens that are proficient in English but prefer to obtain their information in their original language. Not providing them with the information they want to obtain in their tongue could keep many voters from actually participating in democracy. “Hispanics are learning English despite the prevalence of bilingual ballots. English-Only ballots would only serve to disenfranchise Hispanics-which may be the intended effect” (Califa, 317). Eliminating bilingual education is controversial because it has been demonstrated that it will be significantly harder for recent students to adapt to their new classrooms if their language is not utilized to assist them in this early adaptation. Furthermore, there is no scientific proof sustaining that students who are instructed in their native language are more inclined not to learn English and isolate themselves from the rest of the students. “Within one to three years, the majority of students are in ‘regular’ classes conducted entirely in English. […] The shift from Spanish to English is inexorable; bilingual programs do not impede the acquisition of English” (Califa, 319). Based on these facts, it seems that the English as the official language movement is trying to fix a problem that does not exist: “English is not under attack, it is overwhelmingly the language of our government; immigrants want to learn English; and instead of promoting unnecessary divisive policies, we ought to simply help immigrants to learn English” (Marshall, 7). Lastly, antagonists of the movement in question assert that English only proposals are racist and xenophobic, since they target an ethnic group because of its language and customs. They furthermore declare that even though they deny it, the organization targets Hispanics and its main concern is eliminating their power and influence in “American” society. “The English-Only movement is actually an expression of the underlying insecurity about and prejudice towards Hispanics” (Califa, 294). A raise in legal and illegal immigration from Mexico and Latin America has sparked this nationalism, opponents argue, in part because these new immigrant tend to perform jobs at lower wages, therefore “taking” employment away from “real Americans”. It has been proven that sentiments against Hispanics and their linguistic influences are more prevalent in people who are in the lower strata of the socioeconomic scale. To their opponents, “[t]he English-Only movement is fueled by cultural insecurity and prejudice against Hispanics. […] They are frightened by Hispanic immigration and the possibility that Anglos will lose political dominance” (Califa, 347). Claims of racism and xenophobia appear to be the toughest criticism against the English as the official language of the United States movement. The English only movement’s proposals appear to be xenophobic and prejudiced in nature and practice, especially against Hispanics. Forcing people to adopt a new culture and forbidding them from using their language and customs goes against freedom of speech and essentially everything that the United States stands for. Prohibiting bilingual voting booths is not consistent with basic voting rights and seeks to disenfranchise a group of people based on their ethnicity and culture. Trying to censure bilingual education will be detrimental to recent immigrants who seek to adapt to their new country. They will be forced to study numerous subjects in an unfamiliar tongue; this will eventually contribute to academic deficit and social isolation. Lastly, waging a war against Hispanics, just because they are coming to the United States in vast numbers and their culture and language are considered a threat by the racial majority is racialist, deplorable, and iniquitous. In the author’s belief, it seems that the English only movement is trying to fix a problem that does not exist in the first place: Hispanics are not trying to impose their culture in the United States, to the contrary, after a couple of generations they are factually abandoning their original traditions and embracing customary “American” values, including the English language. The leaders of these movements comprehend this, but notwithstanding choose to expand their cause and cleverly prey on Anglo-Saxons’ “patriotism” in order to advance an unrelated racist agenda that seeks to debilitate Hispanic influence and power and pretends to force them to succumb to the racial majority in cultural, social, and linguistic terms. For all of the abovementioned reasons the author believes that these movements are an embarrassment to the United States and make a mockery of the liberty and self-determination that this exceptional nation is supposed to signify. English only proposals are slowly taking the country by storm, one state after the other. The laws advanced by the movement prohibit bilingual education, bilingual voting rights, and many other bilingual services that are vital to recent immigrants. These propositions specifically target Hispanics, for they are the largest non-Anglo group in the United States and their culture, language, and traditions are categorized as a menace to “American” values by the influential racial majority. The movements’ antagonists argue that laws prohibiting people from exercising their culture and language are chauvinistic in nature and should not be allowed in a country that promotes individual freedom. The author sides with these detractors and proclaims that the propositions advanced by these organizations that are trying to establish English as the official language of the United States are deplorable since they prove to be prejudiced against immigrants, especially Hispanics. Veiled beneath the linguistic façade, an inequitable political and societal agenda exists that seeks to limit the impact and power of the Hispanic culture and the Spanish language in order to maintain the preponderant and arrogant Anglo-Saxon societal status quo that has dominated the United States for nearly two hundred and thirty nine years. Para la mayoría de los cubanos, la lucha por la libertad nacional es y siempre ha sido el pábulo principal que estremece nuestras vidas. La conflagración contra cualquier yugo o autocracia brota innatamente al padecer en carne propia el suplicio de la tierra sometida. Esta tradición patriótica proviene de aquellos héroes que combatieron inagotablemente por la autonomía de Cuba. La contienda redentora que más envergadura tiene en la historia de la mayor de las Antillas es la guerra de independencia de 1895, ya que gracias a esta, la nación alcanzó la anhelada manumisión de la mano opresora española. El propósito de este ensayo es reseñar los hechos que tornaron a este conflicto bélico en tan trascendental gesta. El apóstol José Martí fue el autor y coordinador de la guerra de liberación de 1895. Habiendo sufrido en carne propia los desafueros cometidos por la corona ibérica, conocía mejor que nadie las razones por las cuales Cuba tenía que ser libre. Al fundar el Partido Revolucionario Cubano, se propuso recaudar los fondos económicos y las armas necesarias para apoyar un levantamiento en la isla. Percibiendo la necesidad de contar con líderes militares de la más alta envergadura para alcanzar el triunfo, convenció al “Titán de Bronce” Antonio Maceo y al “Generalísimo” Máximo Gómez de que ya era la hora justa para reemprender hostilidades. Con la firma del Manifiesto de Montecristi, Martí y Gómez exponen las razones por las cuales el pueblo cubano se lanzaba a un enfrentamiento bélico en contra del despotismo español y el primer alzamiento multitudinario acaece el 24 de febrero de 1895 mediante el Grito de Baire; dejando claro a los iberos que la pugna por la independencia iba sumamente en serio. A menos de tres meses de haberse inaugurado la guerra, pereció en combate el más grande de todos los cubanos: Jose Martí Pérez; perdiendo así la causa independentista a su prestigioso líder civil. Este quebranto trascendental, más que impedimento, fue una inspiración para que los mambises siguieran avanzando y ganando batallas categóricas. El objetivo principal de Maceo y Gómez era extender la lucha a toda la nación, ya que la misma estaba concentrada en el oriente del país. Esto fue conseguido gracias a la heroica invasión de oriente a occidente en donde el mismo Antonio Maceo perdió la vida en diciembre de 1896. Durante esta memorable irrupción a occidente aconteció una de las hazañas mambisas más sobresalientes de la guerra: el cruce de la “infranqueable” Trocha de Júcaro a Morón; para muchos un hecho militar fundamental que alteró el balance de la guerra a favor de los mambises. A raíz de las cuantiosas victorias mambisas, la corona española dictaminó destituir al laureado general Martínez Campos y nombrar al abyecto Valeriano Weyler Capitán General de las tropas españolas en la isla. Este despótico personaje decidió que era imprescindible cercenar de raíz el apoyo que la sociedad cubana le brindaba a los mambises y con dado propósito comenzó a recluir campesinos en campos de concentración; estrategia sangrienta que luego fue nombrada la “reconcentración de Weyler”. Algunos historiadores cubanos calculan la cifra de personas exterminadas en estas prisiones comunitarias en alrededor de trescientos mil. A pesar de disímiles tácticas inhumanas como esta, nada pudo parar el ahínco de las tropas mambisas, las cuales continuaron afirmando su presencia en todo el país. La guerra se encontraba estática a principios de 1898: los mambises no acababan de dar la estocada final y los españoles no tenían forma de aniquilar la insurrección. Para alcanzar una resolución definitiva, al conflicto le faltaba su tercer participante; una nación con aires expansionistas y conocedora de las múltiples riquezas económicas de la isla: los Estados Unidos de América. El quince de febrero de 1898, con la explosión del buque de guerra “Maine” en el puerto de la Habana, a la futura superpotencia mundial le fue infaustamente extendida la justificación imprescindible para adentrarse al enfrentamiento marcial entre Cuba y España. Estados Unidos interpretó esta detonación como una agresión directa española y la guerra contra la frágil monarquía ibérica fue declarada el 19 de abril del año en cuestión. La incursión de Estados Unidos a la guerra aceleró la presagiada derrota española. Las batallas fundamentales fueron navales y demostraron el poder de las modernas armadas angloamericanas ante las anticuadas flotas iberas. El fastuoso poderío militar estadounidense hizo que las ya desgastadas tropas ibéricas duraran únicamente un par de meses antes de perder calamitosamente y negociar los términos de la rendición. El primero de octubre de 1898 comenzaron en Paris las conversaciones entre España y Estados Unidos para decidir el destino de Puerto Rico, Filipinas y Cuba; las delegaciones de estas tres naciones nunca estuvieron presente. 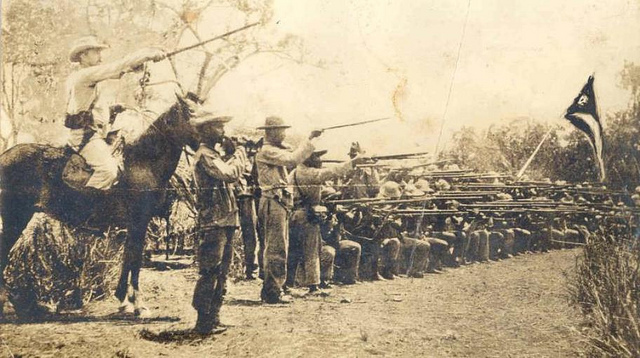 A pesar del papel fundamental que tuvieron los Estados Unidos en la guerra de liberación de 1895, nunca se debe olvidar que los mambises fueron los que verdaderamente rompieron las cadenas del yugo colonial. El 24 de febrero de 1899, entró triunfante a La Habana el Generalísimo Máximo Gómez. Al percibir la aglomeración de personas que salieron a su encuentro, estupefacto opinó: “Si toda esta gente hubiese peleado con nosotros habríamos derrotado a España hace muchísimo tiempo”. Sin duda alguna Cuba era finalmente libre del yugo español gracias al denuedo de sus hijos y a la sangre de su pueblo. Las lecciones de osadía, tesón y heroísmo que nos legaron los mambises que combatieron en esta contienda (y las previas), son hoy más que nunca inspiración ineludible para todos aquellos que una vez más gritamos “Viva Cuba Libre” y anhelamos cuando muramos, sin patria, pero sin amo, tener en la losa un ramo de flores, ¡y una bandera! 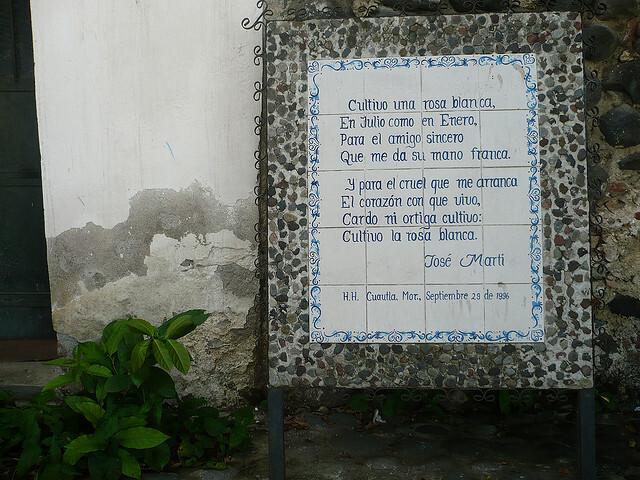 “Te lo prometió Martí y Fidel te lo cumplió” is a renowned excerpt of Cuban national poet Nicolás Guillen’s popular ballad “Se Acabó”. The primal notion underlining the poem is that Jose Marti’s independence revolution was the ideological precursor to Fidel Castro’s communist regime; a conveniently widespread idea in contemporary Cuba. Since the triumph of the so called revolution in 1959, Cuban authorities have embarked in a comprehensive crusade with the purpose of authenticating the communist autocracy by conjoining pensamientos Martianos with ideologia fidelista. In an effort to sustain their farcical convictions, Cuban authorities have prejudicially construed Jose Marti’s literature and advanced four primary assertions: that the Cuban apostle was a communist sympathizer; that his party (Partido Revolucionario Cubano) served as the forefather to the preponderant Partido Comunista de Cuba; that his ideas supported one party dictatorships; and that he shared with Fidel Castro a profound abhorrence for the United States’ government. The aspiration of this study is to demonstrate how the Cuban nepotism has put forward the aforementioned artifices by misquoting Jose Marti and placing his stances out of context; by impugning the ideas presented by the Marxist autarchy, the author will furthermore establish how the figure of the Cuban National Hero has been altered in order to legitimize a paucity of democracy in Cuba. In an effort to justify single party Bolshevik government, the Cuban autocracy alleges that their Communist Party is the genuine successor of the Cuban Revolutionary Party founded by Jose Marti in the late eighteen hundreds. They furthermore assert that the Cuban patriot sympathized with Communism and that he supported single party monocracy. The finest and most crucial approach to discredit these contentions is by alluding to the writings of the apostle. In 1883 Martí composed an article about Karl Marx stating that “no hace bien el que señala el daño y arde en ansias temerosas de ponerle remedio, sino el que enseña remedio blanco al daño” (Martí, Escenas 288); and that the Communist pioneer “[…] anduvo de prisa; y un tanto en la sombra […]” (Martí, Escenas 288). In these words the Cuban patriot was remarkably explicit; he saw Karl Marx as a leader with good intentions and a noble cause, but nevertheless a revolutionary who was trying to solve the unremitting struggle between social classes by implementing an erroneous philosophical approach. Jose Marti furthermore expressed his disagreement with the communist ideology at the culmination of the essay (possibly vaticinating the near future): “[s]uenan músicas, resuenan cantos; pero se nota que no son los de la paz” (Marti, Escenas 289). The author clearly anticipated the catastrophic nature of a radical revolution like the one proposed by Marx and Engels. Perhaps the most evident criticism of Socialism can be located in a subsequent editorial in which Marti agrees with Herbert Spencer in that “[…] un estado socialista […] sería a poco un estado corrompido, y luego un estado tiránico” (Marti, Herbert 387). Throughout his writings, Jose Marti declared numerous times that the idea of Communism was precarious and his criticism of the ideology corroborates the notion sustaining that he did not sympathize with the extremist doctrine as the recent Cuban dictatorship sustains. In 1973, Fidel Castro categorically stated that “Martí hizo un partido —no dos partidos, ni tres partidos, ni diez partidos—, en lo cual podemos ver el precedente más honroso y más legítimo del glorioso Partido que hoy dirige nuestra Revolución: el Partido Comunista de Cuba […]” (Castro, 12). With these words the charismatic tyrant presented two of the essential allegations buttressing the theory claiming that Jose Marti was the intellectual father of the Cuban socialist revolution: that the apostle favored one-party regimes and that the party that he founded with the purpose of liberating Cuba from Spain set a precedent for Fidel’s Communist Party. Yet again Marti’s words serve as the best ammunition against fallacies of this caliber; in his “Escenas Mexicanas” the Cuban patriot declared in 1877: “Siempre es desgracia para la libertad que la libertad sea un Partido” (Martí, Mexicanas 50). Throughout his writings, the apostle worshiped both freedom and democracy; two ideas that are utterly discordant with one-party autocracy, consequently, to even suggest that he would have approved of a dictatorship like the one that rules in Cuba is fraudulent and opprobrious. Cuba’s one party monocracy can be traced back to Lenin and Stalin’s ideas of government, not to Jose Marti’s Partido Revolucionario which principal intention was to unite Cubans in order to liberate the country from colonial rule. “There exists a single party in Cuba not because Marti founded only one party, but because, first and foremost, it facilitates the rulers’ desire for absolute power and shields them from electoral defeat” (Ripoll, 15). Only by understanding why and how Marti’s party was founded we can isolate it from tyrannical political organizations like the one ruling Cuba. The leading objective of Marti’s party was to coordinate the armed struggle against Spain and to emancipate Cuba; they were trying to “[…] preparar, con cuantos medios eficaces le permita la libertad del extranjero, la guerra que se ha de hacer para el decoro y bien de todos los cubanos, y entregar a todo el país la patria libre” (Cuban Revolutionary Party’s bylaws, Article V). Marti did not define when he created the party the political specifics of a postcolonial Cuba, “there is no evidence [in the bylaws of the parties or any of his writings] of a desire to establish any sort of dictatorship” (Ripoll, 19). However, one idea that it is clear throughout Marti’s literature and the organization’s decrees is his devotion for authentic democracy: “El Partido Revolucionario Cubano [se propone] fundar […] un pueblo nuevo y de sincera democracia” (CRP’s bylaws, Article IV). Consequently, to trace the origins of Bolshevik ideology and political organization to Jose Marti’s party is preposterous for two main reasons: the Cuban patriot believed in genuine democracy which is the antonym of Communist government and one-party rule, and his party’s intention was not to govern Cuba but to liberate it from Spain. Marti’s famous observations of North American society (“Escenas Norteamericanas”) have been distorted by the dictatorship and utilized as the chief “substantiation” backing the idea that the apostle shared with Fidel Castro and the Cuban nepotism an intense hatred for the United States’ political institutions and way of life. By profoundly exploring his conjectures regarding the United States readers can discover that they are both ambivalent and polemical, consequently, a further interpretation is required in order to discredit the theses advanced by the communist dictatorship. It is imperative to commence this analysis by recognizing that Marti was indeed an anti-imperialist who deplored several United States foreign policies from the epoch; but to distort this into declaring that the apostle shared with Fidel an enormous detestation for this capitalistic society and its way of life is an oversimplification of his perspectives and hence, a mendacity. There existed both reprobation and admiration in Marti’s writings about the United States; the Cuban government, in an effort to relate the patriot’s conceptions with those of Fidel Castro, ignores the former’s praise of the American democracy and exclusively affirms and promulgates his disapproval. A more legitimate analysis should explain how and why Jose Marti’s impressions gradually shifted from adulation to criticism in the interval of approximately fifteen years that he lived in New York. From 1880 until his death in 1895, Marti wrote extensively about the United States and his topics reported from daily life observations to extensive analysis of political institutions and foreign policies. A vast number of his initial reflections were remarkably favorable: “I am, at last, in a country where everyone looks like his own master. One can breathe freely freedom being here the foundation, the shield, the essence of life” (Marti, 103). The apostle admired the industriousness and willingness to succeed of the American people, he similarly praised Capitalism and the opportunities that this system provided for people to pursue and (with hard work) attain freedom and happiness. “[The idea] of giving ‘a fair day’s work for a fair dollar fascinated Marti, who never ceased to praise the industry and ingenuity of the North American workers” (Kirk, 278). In numerous occasions Marti expressed that the American model needed to be imitated in Latin-American nations in order for these to develop social and economically. From 1885 to roughly 1890, the Cuban patriot began criticizing key aspects of American politics. Specifically alarming for him was the fact that “[h]e seemed to think that most people were so preoccupied with working hard to save money and better their standard of living that politics had little to offer them” (Kirk, 279). In addition, Marti reprehended the “carnival atmosphere” that existed in United States’ politics (particularly during elections), the way demagogues and agitators were able to incite and control the politically uneducated masses’ passions, and the administrative corruption that existed at all levels of government. Nevertheless, “Marti still considered this unfortunate system infinitely more acceptable than the total lack of democracy in Cuba [and almost every Latin-American country] of that time” (Kirk, 280). Regarding this topic, he masterfully declared in one of his editorial: “¡Oh! muchos votos se venden; pero hay más que no se venden” (Marti, 123). The radicalization of Marti’s opinions against the United States occurred towards the end of 1889 as a result of perceiving its imperialistic intentions to conquer and subdue Latin-American countries, including Cuba, in an effort to augment its influence, power, and territory. “His basically sympathetic attitude became noticeably more critical as he attacked the powerful political elite which was encouraging territorial expansion into ‘Nuestra América” (Kirk, 284). This ideological transformation reached its pinnacle when the idea of acquiring Cuba from Spain started being discussed by American legislators and gained popularity throughout the United States. “For Marti, any attempt to sell his patria as if were some negotiable merchandise […] was completely unacceptable -particularly when the prospective purchaser was the United States” (Kirk, 284). Thence, as analytical interpreters we must place Marti’s opinions after 1889 in this turbulent context. Jose Marti was a reasonable and sensible essayist genius, but when it came to the subject of Cuba he was fanatically in love with its emancipation. Therefore, most of his views describing the United States after 1889 were influenced by this fervent passion that he felt towards Cuba, and the imminent danger that the powerful nation represented to the island’s independency aspirations. Based on this information, we allege that renowned phrases like “Viví en el monstruo y le conozco las entrañas […]” (Marti, Letter 1), when taken literally, do not represent Marti’s feelings towards the United States, its culture, people, or government; they are merely patriotic rejoinders to perceived planned aggressions of the United States against Cuba’s determination to be free. To compare Marti’s feelings towards the United States to Fidel Castro’s is a complete tergiversation of history. The later abominates its capitalistic society, laws, form of government, freedom, and openness (all of them qualities esteemed by Jose Marti); while the former predominantly expressed admiration for the egalitarian nation until he observed that the United States was certainly planning to interfere with the emancipation of his idolized homeland. 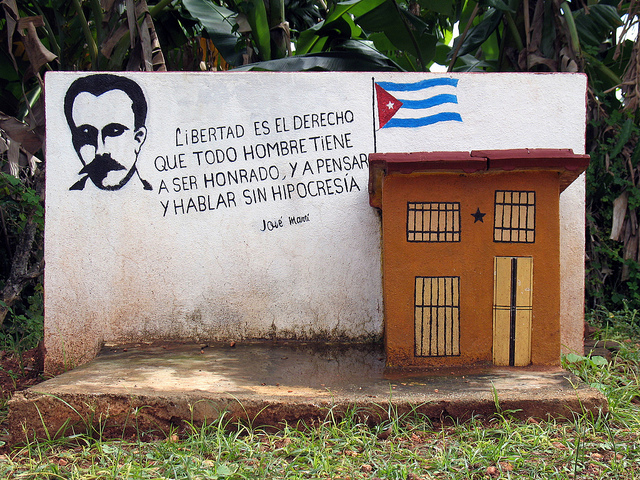 In modern day Cuba, Jose Marti’s figure and ideas are artificially interrelated with Fidel Castro’s doctrines. The Communist absolutism has accomplished this by misrepresenting the apostle’s attitudes and placing his opinions out of context in an effort to legitimize their ignominious political and social systems. In this essay we have demonstrated that the dictatorship’s central assertions buttressing the conception they advance are inaccurate and deceiving. Jose Marti was not a Communist sympathizer, he rejected and criticized the ideology; he did not favor one party government, he idolized freedom and genuine democracy; his Partido Revolucionario Cubano shared no similarities with the Cuban Communist Party, the former’s intention was to liberate the nation, the latter is to subjugate it; he did not execrate the United States like Fidel Castro and his government do, he admired all the noble and democratic qualities of this great nation and only commenced to criticize it when he felt that the independency of his beloved Cuba was at stake. One day, when Cuba becomes free, we hope that articles like this will help the Cuban people to open their eyes and realize that they have been historically deceived. The leading intention of this work is to serve as a guide to those who want to comprehend the distinctions that exist between pensamiento Martiano and ideologia fidelista. The author is convinced that this objective has been categorically achieved. por eso vuelvo al pasado, despacio, cuando te escucho. entenderás que en mi ayer me refugio de este hoy. a los juegos de pelota happening right after school. pero el fantasma de Cuba is always around me walking. se asoma ante un viejo aroma y me despierta un bostezo. esos que hace nueve meses nos mantienen tan unidos. descubre lo que olvidé, conmigo en cada salida. 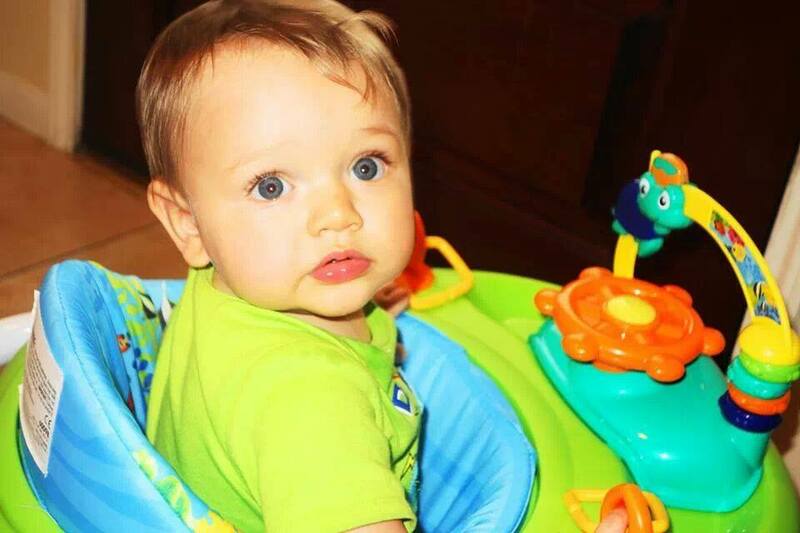 voltea, me dice papa, sonríe de nuevo… vuelo. que paso tocando el cielo mientras le cambio pañales. me derrumba, me estremece, me hace temblar cuando llora. el aborto no es opción, ¡vamos a tener un hijo! The United States and Cuba have experienced a gradual crumbling of their political relationship ever since the island became communist in the early sixties. As a result of these tensions, the superpower has implemented diverse procedures in order to enfeeble and keep its close neighbor regimented. Some of these strategies have been extremely valuable when dealing with major crises, but others have proved to be totally unproductive and offensive to the international community. The Cuban Missile Crisis illustrates an instance in which the United States (especially John F. Kennedy and his advisors) was highly effective in dealing with a tense and potentially lethal emergency. This specific course of action was praised around the world and the American superpower was recognized for preventing a global catastrophe. The Cuban Embargo, contrariwise, has demonstrated that it is a profoundly incompetent and ignorant approach to the Cuban conundrum. The perpetuation of these inhuman prohibitions have received a strong wave of universal criticism. The examination of these divergent behaviors provides us with an insight into the ambivalent perceptions the international community has towards the United States. Fidel Castro’s victory in 1959 represented a substantial menace to the United States. The superpower was entirely immersed in a Cold War against the Soviet empire and its Bolshevik forces, and the paramount fear in the minds of the American leaders was the propagation of communism. The Cuban hazard was especially serious mainly because of its geographic position (ninety miles away from South Florida). All of these circumstances made the island a key player in the Cold War for both superpowers. In order to deter the Cuban threat, the United States launched a military invasion in 1961. The Bay of Pigs incursion was a complete disaster and the attackers were defeated in only three days. The disappointed invasion bestowed credibility and international admiration on Fidel Castro and its fresh administration, and also provided the Soviet Union with an excuse to safeguard its close ally. In 1962, a couple of months after the invasion, the soviets started to infiltrate missiles in Cuba, taking the United States by surprise. “[…] [T]he most senior Kennedy administration officials were uniformly convinced, with one notable exception, that Moscow would never introduce nuclear weapons on the island” (Cyr 2012:7). The Bay of Pigs invasion inadvertently led to the Cuban missile crisis of 1962; one of the most frightening episodes in human history. In the early months of 1962 the United States started getting reports from its military and intelligence agencies stating that the Soviets were providing Cuba with nuclear armament. They were able to photograph SAMs, but the evidence was not conclusive in regards to offensive missiles. “Despite rising concern in Washington there was no clearly actionable evidence of a Soviet missile capability in Cuba” (Cyr 2012:8). The American superpower needed decisive proof indicating the presence of nuclear weapons on the island and the military started working intensely in order to achieve this purpose; but it was not until September that they were able to produce such confirmation. “On September 21, Washington received the first really reliable report to the effect that more than just SAMs were being unloaded on the docks of Havana” (Cyr 2012:7). This evidence needed to be analyzed by experts in order for Washington to be indubitably certain about the precarious nature of the situation. The investigation took nearly three weeks, and by October 15th, the United States’ leadership was ready to take action. Instead of utilizing his whole cabinet and all of his advisers to craft a strategy in order to deal with the threat, Kennedy handpicked the specific people that he wanted working on this situation. The group (that later became to be known as the ExComm) had deeply divided opinions: some wanted to use an airstrike against Cuba and others were convinced that a peaceful resolution was achievable. Against realist recommendations, the Commander in Chief decided to take a more liberal approach to the situation. “On October 18, President Kennedy met with Soviet Foreign Minister Andrei Gromyko” (Cyr 2012:12). The purpose of this meeting was to let the Soviets know that Washington did not want a nuclear war with its communist enemy and that their goal was to achieve a nonviolent agreement. The Minister assured the President that the reports were wrong and denied the existence of nuclear weapons. It seemed that the liberal methodology was not being effective. On October 22nd, Kennedy took a firm posture on his televised speech. He announced new measures to deal with the nuclear provocation, established explicit expectations, made clear that noncompliance would result in military action, and at the same time left a door open for political compromise. Both superpowers came to an agreement behind closed doors, with the United States promising to remove its offensive missiles from Turkey in a certain amount of time if the Cuban weaponry was dismantled. “On October 28, Moscow publicly accepted the American offer to provide a pledge not to invade Cuba if the missiles were removed” (Cyr 2012: 14.). Nuclear confrontation (and perhaps the end of the world as we know it) was averted. John F. Kennedy and the ExComm dealt with this situation outstandingly. By utilizing both realist and liberal strategies they were able to intimidate the aggressor and at the same time call upon compromise and nonviolent resolution. The nuclear nature of this threat forced the United States to give in to some demands. Doing this behind closed doors was a major achievement that prevented the superpower from being perceived as impotent or ineffectual by the international community. To the contrary, the world applauded Washington’s actions and the crisis arguably gave more credibility to their cause. There is no doubt that our planet came extremely close to annihilation in 1962; this did not happen in great part thanks to the way in which Kennedy and his team handled the chaotic situation. “The crisis has been described as President John F. Kennedy’s ‘finest hour’ in a touchingly brief tenure in the White House” (Cyr 2012:5). Unlike the policies implemented during the Cuban Missile Crisis, the Cuban Embargo has been reprimanded universally for being both inhumane and ineffective. The economic sanctions were imposed by the United States right after Castro’s successful revolution in 1959. While the commercial restrictions were initiated to a certain extent by Eisenhower, it was “Kennedy [who] imposed a full embargo on the island in 1962” (Borer & Bowen 2007:129). The chief motives behind the blockage were the nationalization without indemnification of key US industries by the socialist regime (the most prominent being the United Fruit Company and Texaco) and a reforma agraria (agrarian reform) that similarly affected US interests in Cuba. Fifty one years later, this realist course of action continues to mark the factual basis of Cuban – US relationships. Although the embargo was perhaps the right strategy to put in place in response to the Cuban violations, its perpetuity has been the subject of severe criticism by almost the entire world in recent decades. The three chief arguments objecting the embargo maintain that it only hurts the Cuban people, that the ultimate goal (the removal of Castro and the annihilation of Communism in Cuba) is unattainable, and that the totalitarian administration benefits from these commercial restrictions. The economic constraints imposed on the island bring hunger and malnutrition to regular Cubans, not to Fidel Castro or the leadership of the preponderant Communist Party. Instead of revolting against the regime (the intended purpose), the people blame the United Stated for the scarcity because they have been indoctrinated to believe the government’s rhetoric which blames the Yankis and their “genocidal” embargo for everything evil that happens in the country. The main purpose of an economic boycott in international relations is to “bring about behavioral change on the part of the target state by the state that withholds trade” (Borer & Bowen 2007:129). This has clearly not been the case with Cuba; the dictatorship continues to oppress dissidents and abuse human rights. The most troubling detail is that plenty of evidence exists corroborating that the outdated strategy allows the Communist monocracy to stay alive. “Maintaining the embargo allows Castro to squash all dissent based on the national security argument that Cuba is under threat from a hostile neighbor” (Borer & Bowen 2007:131). Furthermore, his authoritarian regime uses the commercial blockade as an excuse for the poverty and underdevelopment that have resulted from their disastrous economic, social, and political approaches. Cuba, Venezuela, the European Union, and almost the entire world have denounced the embargo plenty of times in the past decades. Cuba’s proposals to end the embargo in the United Nations have been approved almost unanimously. Since the United States is a member of the Security Council, the passage of these Gnocchi has no significance whatsoever. A venue that has proved to be especially effective in resolving issues of this caliber is the World Trade Organization. Although Cuba has been very vocal on their criticism towards the embargo in the UN, they have not utilized the WTO in order to resolve their quandary. “Castro’s Cuba may have decided not to challenge U.S. sanctions within the WTO out of fear of being successful” (Borer & Bowen 2007:128). This substantiates yet more how the Cuban embargo is in fact in Fidel and Raul Castro’s best interests. The United States urgently needs to change their approach towards Cuba. The Cuban embargo is inhumane, absurd, immoral, and above all ineffective..The superpower needs to lift the economic blockade in order to leave the Communist tyranny deprived of excuses to blame their social, political, and economic fiascos on. Both Democrats and Republicans have to make a stand and be strong against the political pressures to maintain the embargo that will come from influential Cuban-American groups in Florida. This course of action is not in the United States or the Cuban people’s best interests. By perpetuating an obsolete approach that has not been practical in over fifty years, the American superpower is only damaging its international image and helping its enemy hang on to power. The United States, like any other country, has been both accurate and erroneous in their international policies and strategies. The Cuban Missile Crisis’s management and the Cuban Embargo are illustrations of both an efficient and an unsuccessful policy. If the American superpower is able to amend its erroneous behaviors by utilizing the same principles and ideas that worked in previous occasions, it will be able to enhance its global image and conquer the minds and hearts of a vast part of the international community. As the sole democratic hegemon in the planet, the United States has an obligation to lead other governments by example. The only way to accomplish this goal is by reforming unpopular and opprobrious foreign policy conducts and emulating former procedures that brought honor, respect, and admiration to the great nation. Following this ethical and righteous course of action is in the United States and humanity’s best interests. pude hacerlo tatuándome tu sonrisa. el butacón de la esquina de mis sueños, de tu casa. la cama desesperada de ayer que te necesita. la mano que al desnudarte la hiciste llamarte musa. envejezco reviviendo tus recuerdos en mi mente. me decías que jamás me olvidarías, te creí. escápate a la laguna, acerca tu vida al monte. sumérgete entre la brisa que mi bolígrafo pinta. sufre, llora, vive, siente, bosteza, camina, ama. saca a la melancolía de brazos junto al deseo. te brindo esa melodía de día tan necesaria. atrévete, sin excusas, y vas a ver que es mejor.